Protecting your license plates is something you may not think about...but you should. 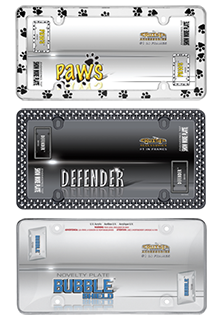 We have so many types from covers that protect the entire plate to frames that protect just the outer portions. Each one will either give you a classic look or a fashion look depending on your style. Come and check them out now! We have the lowest prices in the nation. GUARANTEED!